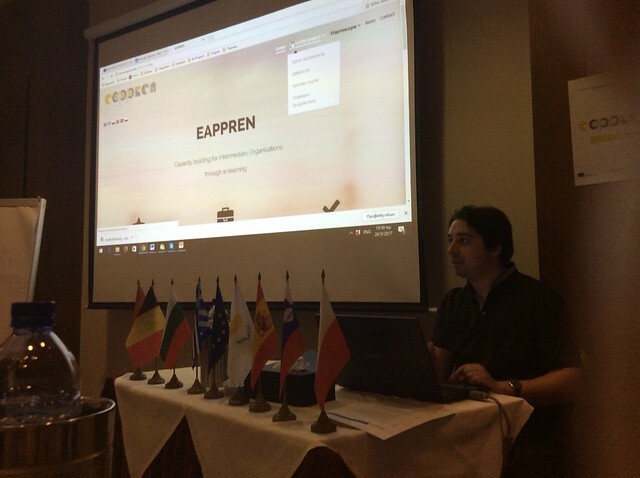 The EAPPREN project partners met this week for their second transnational project team meeting to plan the development process and curriculum for a training programme which focuses on building capacity amongst Intermediary Organisations to take an active role in promoting and supporting high quality Apprenticeships in the partner countries and beyond. The partnership is drawn from a number of EU member states (Latvia; Bulgaria, Cyprus, Greece, Spain) and EfVET that brings together Federations of Industries, Chambers of Commerce, Business support organisations and Vocational Education and Training providers. It is well recognised that collaboration is a must in the drive to expand opportunity and learning through Apprenticeships. VET providers often struggle to connect with SMEs in this regard and there is often a mismatch between the curricula development and business need. SMEs struggle in terms of allocating time and resources to participate in the learning process. Intermediary Organisations are considered to be an important conduit and meeting place to promote such necessary collaboration. “In today’s world qualified Apprentices will make Industries and all business enterprises more competitive. This project is aimed primarily toward those countries where the Apprenticeship framework is in the early stages of development and we are confident it will assist in our capacity to move forward” (N. Kotsonis, General Director of The Federation of Enterprises and Industries of the Peloponnese and Western Greece). The main aim of the project is to develop a training package to support the bringing together of SMEs, VET providers and support organisations such as Federations, Chambers of Commerce; Municipalities; Voluntary agencies to promote and expand the take up of Apprenticeships offering a toolkit and good practice examples to give Intermediary Organisations the opportunity to build their capacity to engage in the delivery and expansion of high quality Apprenticeship provision. In addition to the new training package the partners are creating an innovative on line matching tool to bring both prospective Apprentices and SMEs together. Follow our development as we design the EAPPREN training programme, test and refine before fully launching the final product. For more information vist www.eappren.eu.